Ever since I was a kid, I've been a list maker. I make shopping lists, chore lists, blog task lists, even bucket lists! During my pregnancy with Grace, writing became and still remains difficult. Cramping and numbness in my hands while writing even the shortest note. When we switched to iPhones last year, I was thrilled with the "notes" feature. It made making a shopping list really simple...especially since all I had to do was send it to Joe via a message or email so he would know what needed picking up on his way home. Although, I found a solution to writing out my long grocery lists, there's still nothing like a hand-written task list to glance at on my desk while I sit at the computer. 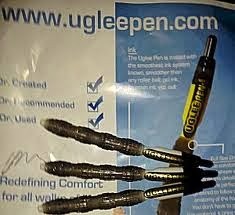 For this reason alone, I was thrilled to come across the opportunity to review (and giveaway) the Great UGLee Pen! I giggle at the name, but truly, this ergonomic pen lives up to it's name. It's definitely not the most attractive pen in the drawer! When the package arrived, I couldn't wait to open and try the pen! There were three pens in the package. I opened the black one first and was surprised at the size of the comfort grip. I hadn't expected it to cover more than half of the pen. It does make sense, though, as not everyone holds their pen the same way. I tend to hold my pen closer to the point, while others may grip the pen toward the middle or even higher. I like that the pen has finger tip grooves at multiple spots of the grip to allow the user to hold the pen as they wish. Since I received three pens, I sent one into work with Joe. He asked a co-worker to give it a try and he was pleased with how the pen wrote. It was a comfortable fit, as he writes for most of the day and the smooth flow of the ink was good for lots of stopping and starting throughout the day. I'm so happy to have the chance to give away a set of these comfortable pens to one of our lucky readers!